SINGAPORE, October. 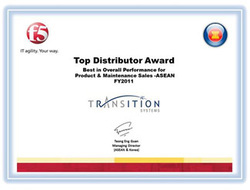 5, 2011 – Transition Systems Group, a leading regional distributor of IT solutions, was presented with f5 Top Distributor Award for Year 2011 at f5 Agility Forum 2011, held at Raffles Convention Centre, Singapore, on 4 October 2011. This award also seals Transition Group as Authorised Distributor of Year 2012.